Those living in domestic areas sometimes have their mailbox attached to their home for hassle-free carrier access and they have a few options available for a wall mounted residential mail box. They’re no longer restricted to the old normal mailbox with a flip top into which the mail is dropped, as well as a pair of loops towards the bottom for newspaper delivery. Nowadays there are many designs of mail boxes which can be attached to the wall for convenience as well as to add an attractive flair to the front of your home. Different designs and materials offer the homeowner wall mounted mailboxes that fit into their house’s style and present day materials run the spectrum of affordable metals to solid wood and even to such things as brass and steel. They could be found in designs to match the home on which it is mounted, with cutout house windows to both offer ventilation to the contents as well as to permit the homeowner to decide if the mail has already been delivered without opening the box. Years ago, glass mail boxes were popular with a lot of people as they could see in a flash what was in the mailbox. The dilemma was, so could thieves, and these mail boxes were replaced by ones which could not be seen through. Right now, some wall mounted mailboxes also have locks that prevent unauthorized access to the mail. You’ll notice essentially two sections in this type of mailbox; one in which the postal delivery individual can drop in the mail and a second locked section that’s readily available only to the individual with the key. 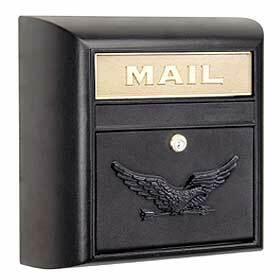 Many of the newer wall mounted mailboxes are made of heavy-duty steel to prevent tampering if they are locked. The key issue with any type or style of wall mounted mailbox is that they must meet, or exceed the requirements of the United States Postal Service. If the postal service has not accepted the mailbox, no mail can be delivered. Most USPS approved wall mounted mailboxes will have a notice placed on the mailbox somewhere. If not, the letter carrier will return your mail to the post office for pickup.